﻿ Greenwashing. Environment: Perils, Promises and Perplexities - Latitudes, Ilaria Bonacossa (Ed.) - The Bookmakers Ed. What is at stake in today's constant bombardment of ecological guilt, corporate agendas and political point-scoring with respect to so-called 'environmental issues'? How can we balance personal responsibility with collective consensus, local with global, or short-term remedies with visionary strategies? 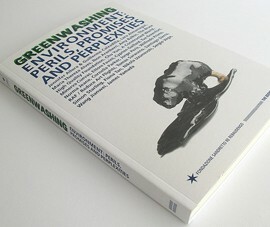 The works of the 25 artists and artist groups presented in Greenwashing. Environment: Promises, Perils and Perplexities at the Fondazione Sandretto Re Rebaudengo, Turin [45° 04' N, 7° 40' E ] do not just passively lament the degradation of our planet, or provide pragmatic solutions. Instead they actively articulate the contradictions and responsibilities that we are encountering personally and as a society. The terminology and agency around 'the environment' and sustainability has become increasingly asymmetric and immaterial. Emissions' offsetting, food miles, environmental marketing, carbon debt, ecological footprints, and so on, are all recently-coined terms, tied to the anxious sense that the processes and practices of modernisation and globalisation, industrialisation and urbanisation have induced unprecedented deprivations and intrusions on the planet. Consequently there is the familiar refrain to limit growth, particularly in the developing world. The artists presented in Greenwashing – a term used to describe misleading ecological practices – do not necessarily proclaim a 'correct' ethical or 'green' agenda, but allow the possibility for broadening and analysing our understanding of what ecology might mean today. Their works often adopt process-based and speculative approaches concerning fundamental ecological subjects such as energy and resource use. Likewise, several artists in the exhibition consider waste, water, land use, the air we breathe and the oil we consume, offering a critical perspective on the perils, promises and perplexities that have emerged as our climate changes. A full-colour 192-page catalogue complements the exhibition's explorations of these themes with texts on each of the 25 artists, an extended interview between the curators – Latitudes and Ilaria Bonacossa – and texts by Francesco Bonami, Marco Benatti and Riccardo Boero. Embracing environmentally conscious design with a degree of irony, each of the books' thirteen sections are printed on a different 'eco-paper' with their corresponding eco-credentials. Published by: The Bookmakers Ed.